Those are the words my my father-in-law said when he saw me preparing this tilapia for dinner last night. And I’ll tell ya, it was pretty exciting. I pulled this recipe out of Liz Weiss and Janice Bissex’s newest cookbook, No Whine with Dinner. I’ve been following these ladies since I started blogging almost 3 years ago. I have always been impressed by Liz and Janice and their dedication to keeping things interesting and healthy at mealtime for the family. They are always busy with projects, from their weekly podcasts, to their awesome blog and now their second published cookbook No Whine with Dinner (The Mom’s Guide to Meal Makeovers was their first)! 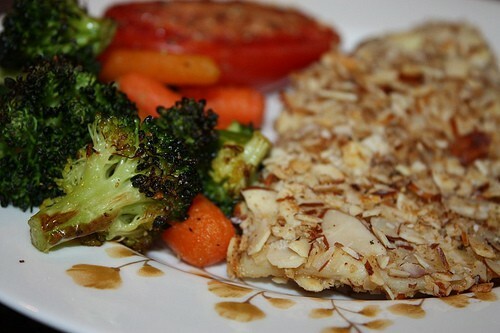 What I loved about this recipe was the awesome crunchy crust on the fish. The Old Bay, cinnamon and brown sugar worked so nicely together. My kiddos ate a whole piece each and continued to ask for more. We’ll definitely be making this again. 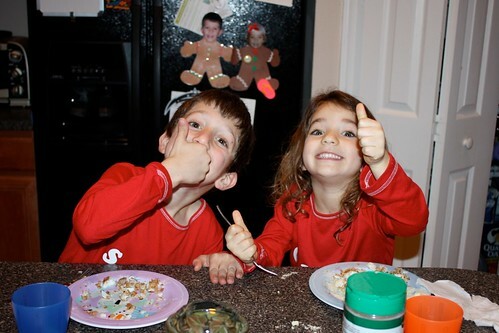 Thanks for the thumbs up kids! Get yourself organized before making this. 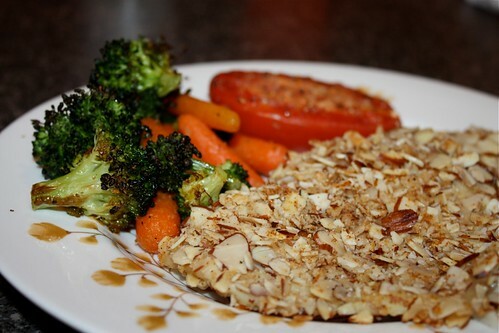 Get your ingredients all out and make the breadcrumbs first…I didn’t chop the almonds, I actually used my fingers to crush them and combine with the panko and seasonings. I loved that the almonds were chunky in the coating, but that was my preference. If you’d like a finer almond crust, by all means, pull out your knife and give them a good chop. Once your breading station is set up, the process is easy…and the fish cooks up quite quickly so dinner will be ready in no time. I roasted up some broccoli and carrots along with some tomatoes at the same time to save time and to keep things easy on clean up too. Try this next time you are in the mood for a good fish dinner. It was enjoyed by all of us and my husband was lucky enough to snag some leftovers for lunch today. I would have loved to have it over a green salad for my lunch today…next time I’ll have to plan better. Preheat oven to 425 degrees. 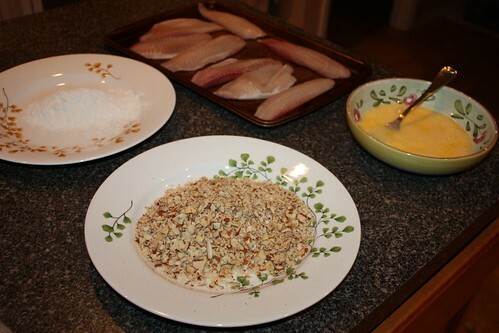 Place tilapia on cutting board and slice each fillet down the center where the fish connects to create 2 smaller fillets. Season both side of the fish with salt and pepper and set aside. Lightly oil or coat a large baking sheet with nonstick cooking spray and set aside. 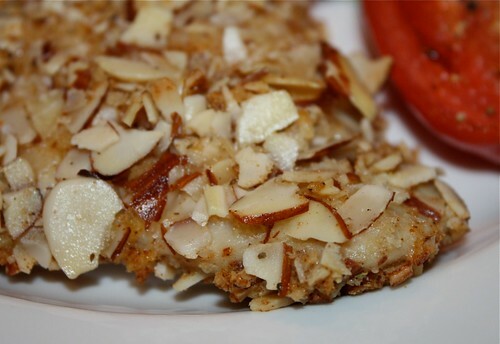 Combine the almonds, bread crumbs, brown sugar, Old Bay Seasoning, salt, cinnamon and pepper in a shallow bowl. Whisk together the egg and water in another bowl, and place the flour on a large plate. To bread the fish, coat both sides with the flour and shake off excess. Dip in the egg and then coat evenly with the nut mixture. Place the fish on the baking sheet, mist with nonstick cooking spray and bake until golden brown and the fish is cooked through, about 15 minutes. 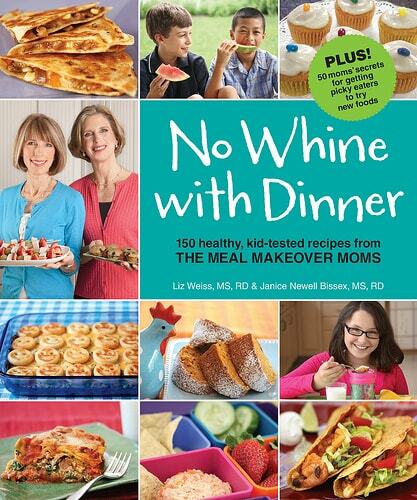 Liz and Janice would love to share a copy of their No Whine with Dinner cookbook with one of my readers. Lots of great recipes in this book including one of my very own in the Blogger’s Best chapter! Along with the Blogger’s Best chapter, you’ll find lots of tips from moms on “how to get your pickiest eaters to try new foods” as well as a great chapter on “healthy basics” and “pantry items”. The fact that Liz and Janice are both registered dietitians and are sharing a wealth of information on family nutrition in each chapter makes this a cookbook that I am very happy to have in my collection. Sorry, giveaway open to US readers only. 1. 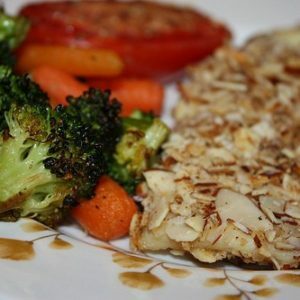 Become a fan of The Meal Makeover Moms on Facebook. “Like” them and then come back and leave a separate comment telling me you did so. 4. Share about giveaway and link back to this post on Facebook, Twitter or your own blog and leave a separate comment telling me you did so.